Appointment Lead Times dictate how far in advance a customer can book an appointment. 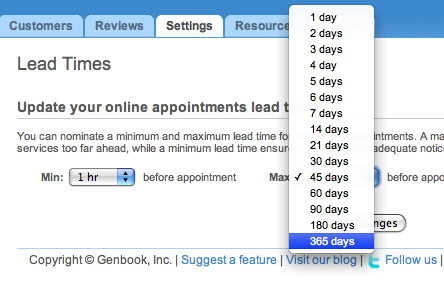 The default minimum lead time is 8 hours and the default maximum is 365 days, but you can easily change these. You’ll see the option of making the minimum lead time anywhere from zero minutes to five days. Be sure to save your changes when you’re done! Tip: Avoid making your Appointment Lead Times too restrictive, as that can cause major online availability problems. Be sure that you set them in such a way that your clients can always find future availability. For example, it’s NOT a good idea to have a minimum lead time of 1 day and a maximum lead time of 2 days, as it’s far too limiting.